Yes it looks like an irresponsible adult allowed a petulant child with a grudge against the creative fraternity loose on a very old software programme and yes, it should never have made it past the idea stage. It’s the creative equivalent of a train crash featuring trains carrying toxic chemicals or nuclear weapons. But does it matter? In the short term, perhaps. Long term, maybe. But it never have happened. 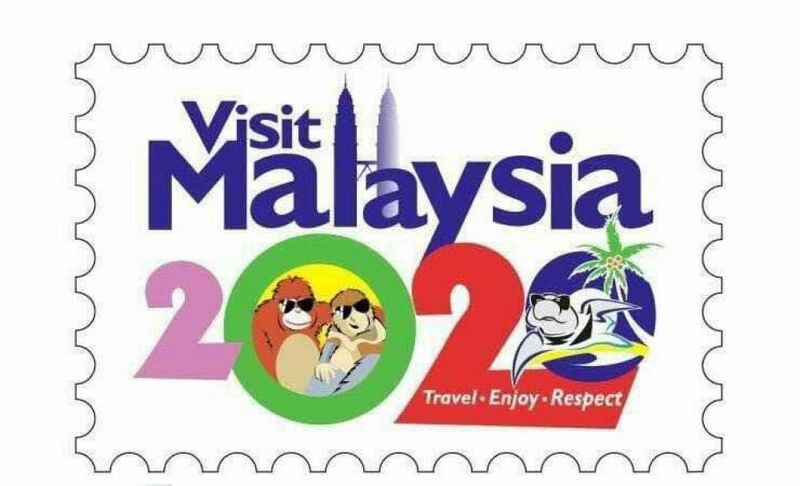 I’m talking of course about the Tourism Malaysia VMY2020 logo (see pic) launched at the end of January 2018 by Datuk Seri Nazri Aziz, the Malaysia Minister of Tourism and derided by much of Malaysia, graphic designers worldwide and respected media organisations such as the Daily Telegraph, the BBC and the South China Morning Post. Despite the negative reaction of, well everyone, I’m going to stick my neck out and say that the reality is the new logo (if it survives and I don’t think it will) won’t have an effect on visitors contemplating whether or not they should visit Malaysia in 2020 (and the years before and after 2020). In fact after being featured on social media and a host of international news channels and publications, it may have provided Malaysia with yet more free publicity. Admittedly not the kind of publicity Malaysia really wants but it’ll take more than negative publicity about a crap logo to attract or stop foreigners from visiting the country. Nearly every business/school/institution and many individuals have a logo. We see logos on business cards, buildings, billboards, buses, lamposts, food packets, print ads, TV ads and just about everywhere else you can stick one. And they sell computers, clothes, cars, cosmetics, finances, food, schools, fashion and fags, alcohol, appliances, airlines and holidays, and just about anything else in between. There are good logos and bad logos, some change on a regular basis, think Google, others stay pretty much the same for years, think Apple or Nike. We’re told logos must be unique yet instantly recognisable. They must have colour because certain colours convey certain meanings yet they must be instantly recognisable and have the same impact in black and white. We’re told that each element of the logo has meaning. A logo designed with sharp, straight lines communicate a strong, trustworthy brand. Curved lines on the other hand communicate a caring and supportive product or service. The rationale for combining curved and straight lines is an ambitious company. And we’re told that everyone should have a logo because they represent the brand and make you stand out from the crowd. But crowds behave differently today and are influenced in different ways. The illustrative style that we recognise as logos today is nearly 150 years old and harks back to a time when Western civilisations moved out of the fields and into the factories. Most of those factories are now here in Asia where we’re living our lives a little differently today than we were back then. The main role of the logo, traditionally anyway, has been to create awareness about a business or in this instance, a destination (and not the country) and help to build a positive image about the business/destination. Logos evoloved to become a symbolic reflection of what the busines/destination wanted to communicate to audiences. And when logos changed, it was meant to be part of an overall strategic shift in direction for the brand and would be one of many elements of that new brand strategy that had to be communicated in a joined up, integrated manner. But over the last 20 years, businesses have got lazy or perhaps greedy. Too many businesses have changed logos in isolation, without incorporating the change into a new strategy. They’ve updated the brand identity and called it a rebrand without making any improvements to the organisation. And then they’ve watched, surprised when nothing changes. Sometimes when a logo changed slightly and the reaction was negative, the brand got away with it. 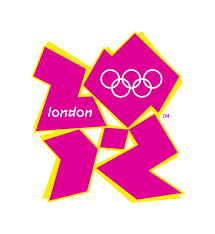 Remember the London Olympics logo? Other times, such as the GAP logo change in 2010, the consumer response was deafening and GAP had to backtrack quickly. But overall, because these changes were ad hoc or tactical, they made little difference to the business delivery. 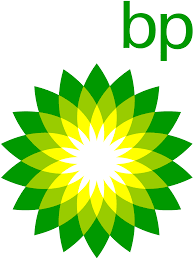 Another classic example is oil behemouth BP. Back in 2000 the firm decided they wanted a new logo that communicated ‘green growth’. Despite spending over US$200 million it was considered a massive failure because the opinion of most people was that there was nothing green about the business of oil. No matter what the company tried to make us believe. And then in 2010, the largest offshore oil spill the history of the oil business put paid to the concept of the green growth oil company communicated via its logo. For many, that’s when logos lost their relevance. With the proliferation of countries competing for the same visitors, too many destinations play safe and compete with the same look and feel, making it difficult for potential visitors to differentiate them. Add to this mix the powerful impact of social media on the travel industry and visitors now use the Internet for research purposes and get most of the information that influences their decision making from content generated by people like them and not logos. The focus has shifted away from the identity of the destination to the experiences of other like minded people in that country. Against this backdrop, it’s hardly surprising then that the importance of a logo will not be what it was. According to the World Travel & Tourism Council (WTTC), global tourism generated $7.6 trillion for the global GDP. More than 105 million international visitors arrived in South East Asia in 2015 and that figure is growing at an average of 8% every year. Many of those visitors will visit Malaysia not because of the logo but because Kuala Lumpur International Airport is an increasingly important hub for low cost carriers servicing destinations such as Vietnam, Cambodia, Thailand, Myanmar and more. And any trip to SE Asia will include visits to other countries in the region. 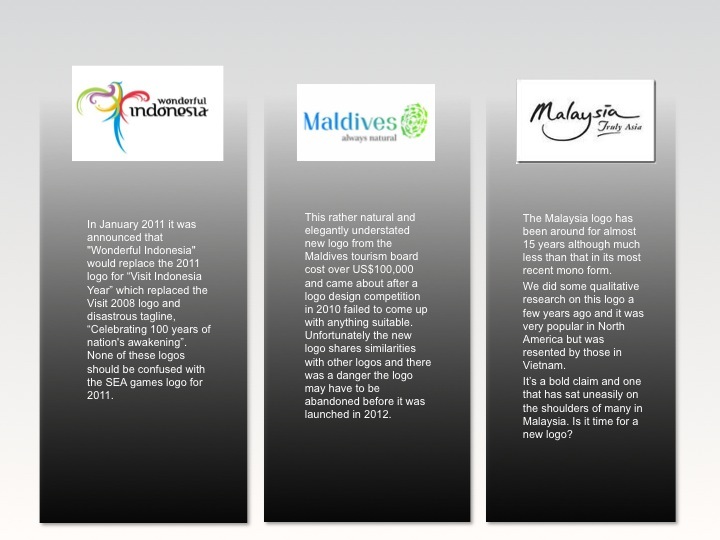 So in terms of the impact the logo will have on visitors to Malaysia, it will be negligible. However, it will help shape perceptions of Malaysia as a country and much of the debate across social media was how embarrassing the logo is for Malaysia. So in terms of the reputation of Malaysia, there will be a perception impact and that will probably add to the negativity about the country. If most of the content consumers read about Malaysia is negative, then perceptions will become negative. And those perceptions can only be influenced and changed with a brand strategy that includes all stakeholders and not with tactical activities such as a new logo, advertising or events. For Malaysia, what’s done is done. What can other countries, states, regions, cities or towns do to ensure their efforts aren’t ridiculed in the same way? Here are 6 lessons that can be learned from this fiasco. They should be applied to any destination branding initiative. 1)	Set up a nation branding task force. Every country or state/city/place should have one. Malaysia used to have one and in 2008 the task force commissioned Fusionbrand to develop the Malaysia nation brand but the plans were canned when a new administration took over and a new department was set up under the new Prime Minister’s Office. This department embarked on a badly researched project about 5 years later that revolved around a tagline and a logo and not a strategy and as a result, lasted little more than a month. 2)	Nation branding is strategic not tactical. Nothing related to the nation brand can be done in isolation. To avoid similar failures, anything related to the nation/state/region/city brand must go through the nation branding task force. And that includes important ministries such as the Tourism ministry. Even state tourism boards and other stakeholders must share with the nation branding task force. 3)	Test identity concepts before launch. No man is an island. But sadly in Malaysia, if a senior person proposes something it is rarely challenged internally, even by marketing professionals hired supposedly for their knowledge. Anything creative should always be tested internally and with multiple consumer segments and the task force. I know it’s time consuming and expensive but which is worse, a delay in the launch or becoming the laughing stock of the world? 4)	Have a plan for your identity launch. Don’t expect to wing it. And be prepared for serious back lash from consumers because most of us hate change. Not many new logos were well received initially. But many of them are now very familiar, think Pepsi, Citi, Accenture, Qantas. After a certain amount of fumbling, the Minister stated, “I have launched it. Nazri Aziz never backtracks. This is what will be used for the world, only one logo, no other logo.” Would a clearly defined, sensible rationale have been a better way to announce the new logo? Absolutely. 5)	Social media is your friend not your enemy. I get the impression, perhaps wrongly that Tourism Malaysia was completely unprepared for the reaction to the logo. Especially on social media. Social Media CAN effect change so learn to work with it. But remember it is not a soapbox. Simple consumer research at the logo development stage on Facebook and Twitter would have saved Tourism Malaysia and the country, a lot of embarrassment. 6)	Logos / taglines etc should not be confused with branding. Malaysia has had a tough time over the last few years with the country struggling to stay relevant in an increasingly competitive environment. It’s hard to find current arrivals figures but the general consensus of opinion is that visitors from wealthy countries or high spending tourists are not visiting as they used to. A lot of this is because there is confusion over what constitutes branding and the Malaysia tourism brand has little differentiation. 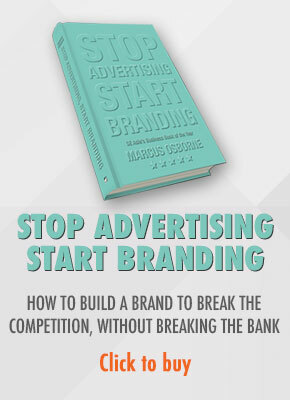 Brand identities / taglines / positioning statements / advertising campaigns and other marketing tactics are not branding. They may create awareness but that rarely convert to arrivals. As I’ve stated already, I don’t think this farce will have much of a positive or negative impact on arrivals. But it’s impact on Malaysia’s brand? That worries me but that’s a discussion for another day. 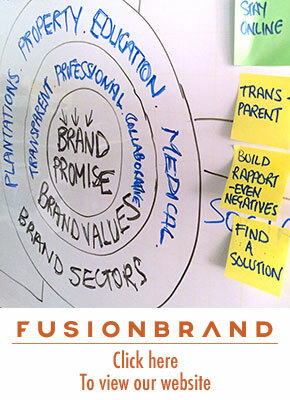 Fusionbrand is Malaysia’s premier strategic brand consultancy. For more information on how we can help you get your branding right the first time, please call +60379542075.